The 30-year-old Red Dog Mine has generated profits for its operator, Canadian mining company Teck. Teck, in turn, pays hundreds of millions of dollars in yearly royalties to the Alaska Native regional corporation, NANA, that owns the land where the mine sits. It also hires hundreds of NANA shareholders. 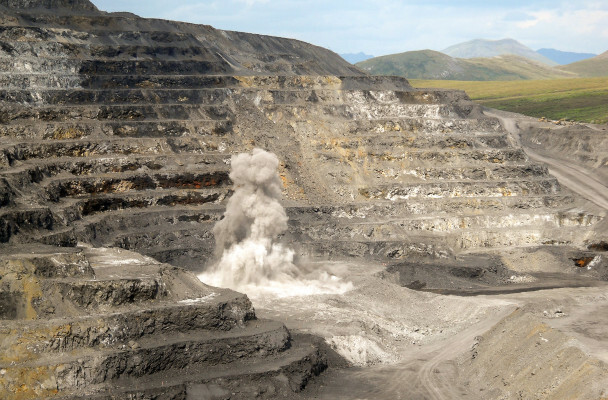 But without a new source of zinc and lead, the money and jobs could disappear in less than 15 years, when Red Dog is expected to run out of ore. Teck’s planned road leads to a pair of new prospects, Anarraaq and Aktigiruq, that could extend the mine’s lifespan. 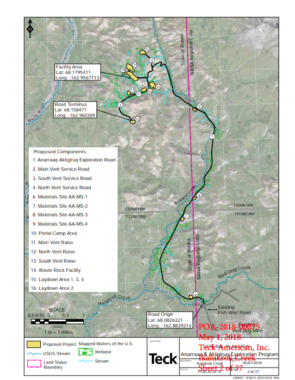 Teck’s plans for a road from the Red Dog Mine to a pair of new prospects, included in documents submitted to the U.S. Army Corps of Engineers. Teck has been drilling into the prospects from the surface, moving equipment by helicopter. Now, the company wants to do more intensive drilling from underground, and it wants to build the road to bring in heavy equipment, according to permitting documents that the company filed with the U.S. Army Corps of Engineers. Teck, in a prepared statement from spokesman Chris Stannell, said it chose the route for the road in consultation with local elders and subsistence hunters. And it’s given helicopter tours to local leaders in nearby Kivalina, who get drinking water and fish from the Wulik River, in the same watershed as the mine. A group of Kivalina residents sued the mine’s operators over wastewater discharge in 2004, in a case that was later settled. One said this week that she’ll be closely watching Teck’s expansion plans. The mine has been operating since 1989 and last year produced more than 500,000 tons of zinc. Its gross profit in 2017 was $971 million, according to Teck’s annual report, and the company paid $325 million in royalties to NANA, which distributes about two-thirds of the money to other Alaska Native corporations under federal law. The mine also employs hundreds of Northwest Alaska residents and NANA shareholders. Teck, in its annual report, said it expects Red Dog to run through 2031. It’s assessing the new deposits to see if it’s “economically and environmentally viable” to extend the mine’s operations past that date, Stannell said. One key fact is that the new prospects are on state land, so NANA wouldn’t collect royalties like it does now — though the road to access the prospects does have to cross NANA land. 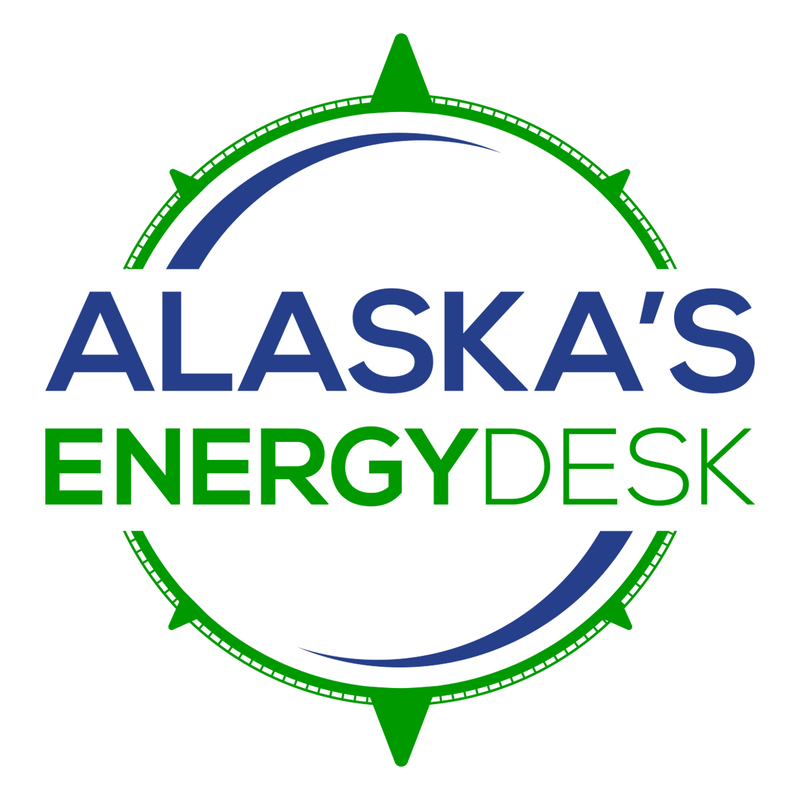 Teck applied with the Alaska Department of Natural Resources in June for permission to build the road, as well as pads for things like a camp and waste rock storage. The state published the plans Wednesday and said it would accept comments on them for two weeks. Some Kivalina residents have “grave concerns” about possible contamination to the Wulik River, said Millie Hawley, former president of Kivalina’s tribal council. Teck’s new prospects are closer to the river than the mine’s current operations.